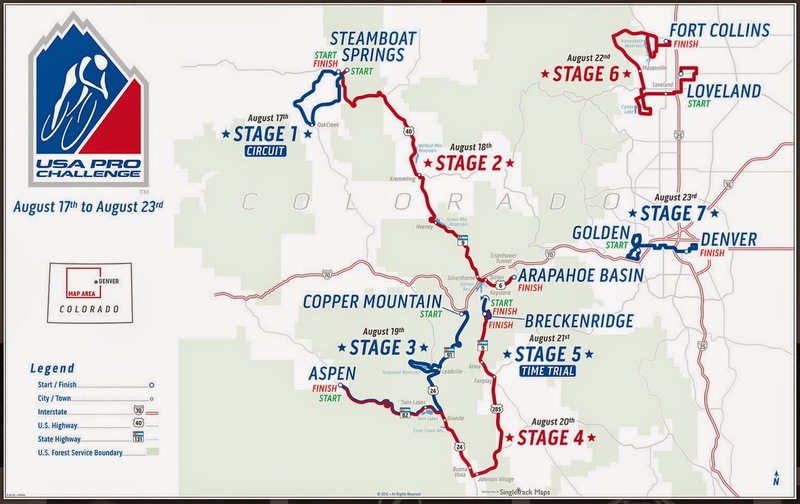 What is the best way to see Stage 2 of the 2015 USA Pro Challenge as a fan? Whether you are a lover of bike racing or fun social events, Stage 2 will be a full day of mountain activity; with opportunities to ride your bike to the stage and enjoy a festive atmosphere. This easy one-page guide is intended to help locals and tourists better plan for watching Stage 2 in Steamboat Springs and Arapahoe Basin. Please note that road closure times and exact finish times sometimes change closer to race day. Find what you need to know about Stage 2 of the USA Pro Challenge in Steamboat Springs and Arapahoe Basin below in the following order: Stage 2 dates, key stage information, start time, finish time, sprint location, KOM location, classification Jerseys, route map, climb profiles, race organization, city tourism, town websites, local events, road closures, VIP tickets, apparel, TV coverage, Tour Tracker app, media coverage, stage preview, recommendations, where to ride, results, current standings and photos. 1.5 hours before start, near the team buses and sign-in podium, are great places for pro rider autographs and see the bikes. Shuttles from Keystone River Run parking to Arapahoe Basin 9:00 a.m. - 2:30 p.m.
Shuttles from Arapahoe Basin back to River Run in Keystone parking 6:00 p.m. - 10:00 p.m.
* The route of Stage 2 has been changed to avoid road construction on SH9. 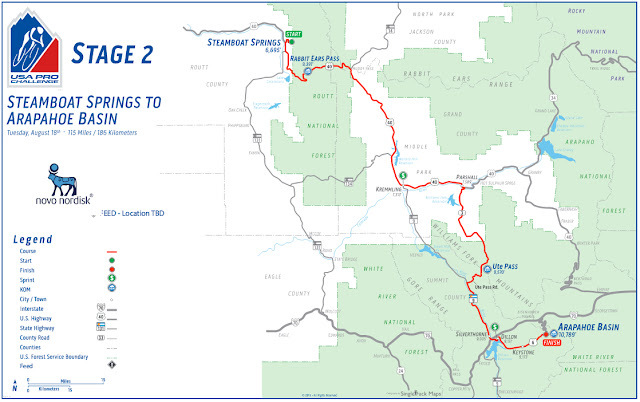 This change now includes the climb of Ute Pass, but does not greatly affect overall timing of the stage. This should be a pleasant cool-air morning departure from Steamboat Springs ... for the first 5-miles. 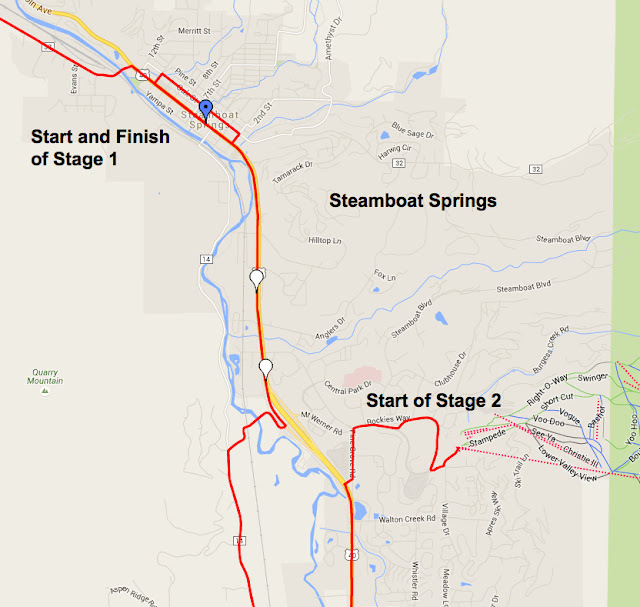 Then the moderate climb (to pros) of Rabbit Ears Pass will quickly stretch the peloton over the next 7-miles. By the decent over the eastern most summit of the pass - after mile 30 - we should have an idea of the established breakaway group to receive the most TV time for many miles. Things probably will not change much over Ute Pass, a moderate 4-5% climb, unless someone decides to accelerate and leave a few behind. After the underpass to Dillon the teams better be in place to give their GC contender the best chance at a Top 10 result. Although this stage is titled as a mountain top finish, locals know this is a broad well-paved road to an established ski resort. The road actually continues up the south side of Loveland Pass (an excellent bike ride! ), but Stage two will finish with a straight away into the parking lot. Arapahoe Basin will be a fun mountain location for a stage finish. Fans should have a great time waiting for the finish by keeping an eye on the big screen TVs and participating in lots of special activities arranged for spectators. What the teams will go through, out on the road while you wait, is a entirely different story. The last 13-miles of the race could be grueling, and at the same time matter greatly to the overall race, deciding the General Classification battle for the week ahead. Teams must deliver their true GC contender safely (and quickly) to the last 5-miles of Stage 2, where an all out top range lactate threshold to VO2Max climb - at altitude - to the line will commence. The winner will be the new (and maybe different from Stage 1, but Taylor has surprised everyone) yellow jersey wearer. 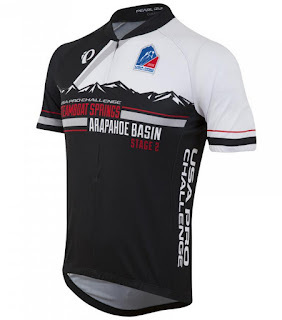 Read much more about the teams selected in this Pedal Dancer® post: Which Teams will race in the USA Pro Challenge 2015? Official startlist of riders has not yet been announced by race organizers. 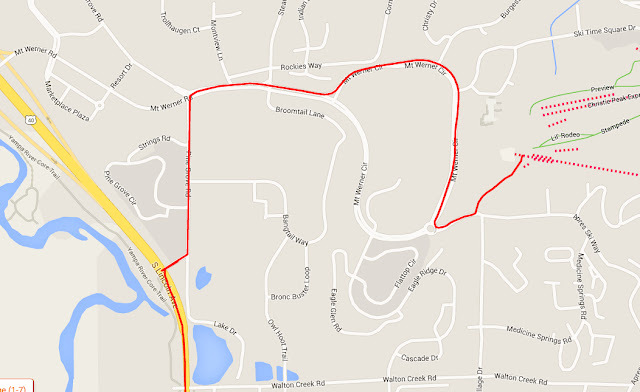 There will be a lap around central downtown, on Stage 1, before departing on the first loop. Ski Town, U.S.A.® is also Bike Town U.S.A! 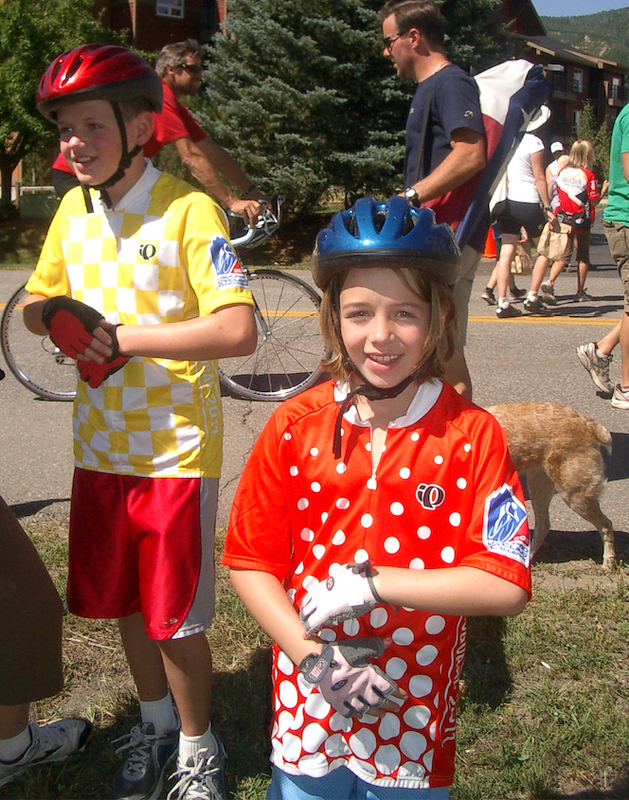 August 15 - Morning, GoRide, Citizen bike event, 25 & 50 miles, Steamboat Resort - Gondola Plaza. Register. August 15 - 5:00-7:00 pm *Team Presentation and Opening Ceremony*, Howelson Hill Ski Area on Howelson Parkway. 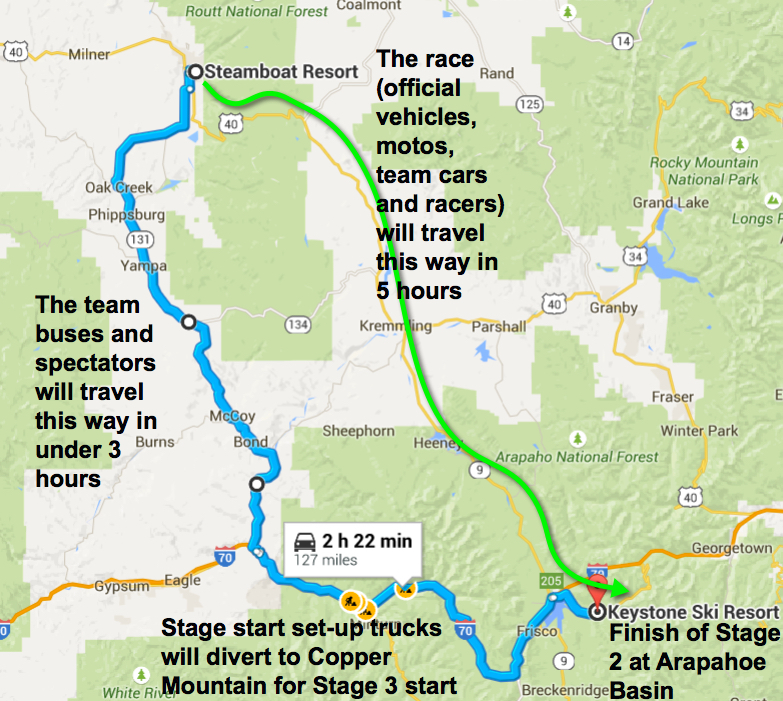 August 17 - 11:30 am, Stage 1 Start; 3:13-4:38 pm Finish; Podium Presentation after. Please use the shuttles, parking will be limited to camping, teams, media, VIP. 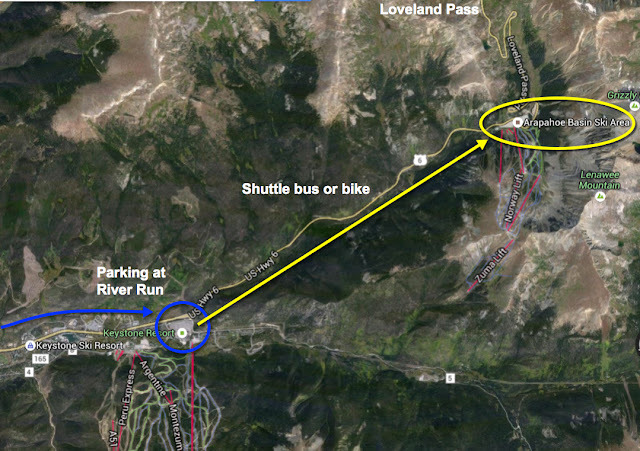 Shuttles will run from Keystone's River Run parking lots to A-Basin's administration lot. You can get to River Run by car or by taking the FREE Summit Stage bus from anywhere in Summit county. Go to www.summitstage.com to view the summer bus schedule. Tuesday, August 18th, FREE shuttles will run from 9:00 a.m. - 2:30 p.m. and will resume after the race from 6:00 p.m. - 10:00 p.m. Loveland Pass reopens to traffic at 6:00pm. Food tents and beverage will be available at the Festival Village. Big Screen TVs will be set up for race viewing and a free concert will entertain you while you wait for a shuttle back to River Run in Keystone. 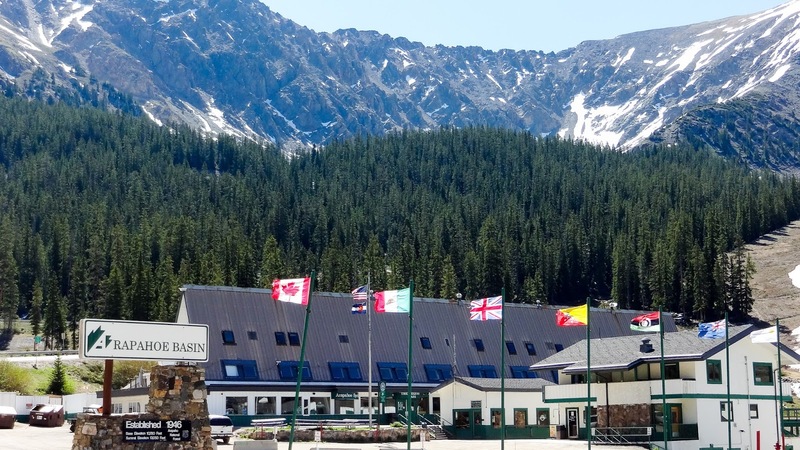 7:00-9:30 p.m. - At COPPER MOUNTAIN, Rider's Lounge, eat and meet riders and announcers. More information. Getting to Arapahoe Basin on race day for Stage 2 USA Pro Challenge: U.S. Highway 6/Loveland Pass is subject to close at ANY TIME. Colorado State Police will be enforcing soft closures of U.S. Highway 6 at approximately 1:30 p.m.; at that time, only shuttles and credentialed vehicles will be permitted on the highway at that time. U.S. Highway 6 will close for ALL vehicles starting at 2:30 p.m. with NO EXCEPTIONS. Here is my tip: When it comes to VIP tickets - buy quality. Quality to me equates to visibility of the true race and need. I do not buy VIP to hob-nob, except with my family who is never too pretentious to recognize "isn't this cool!" 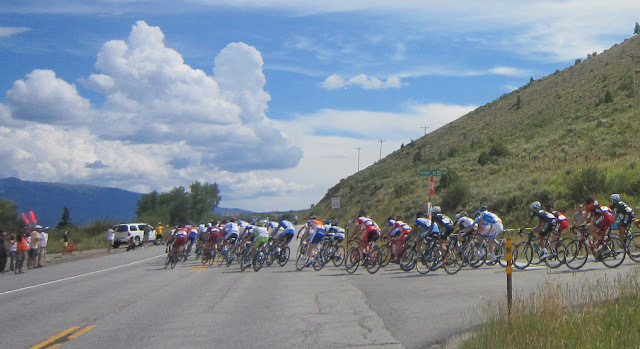 Read more at Pedal Dancer®: Should I buy a VIP ticket to the USA Pro Challenge? Press Conference Daily: the post race press conferences will be shown live on prochallenge.com. Media Coverage of the race will be provided by: Velo News, Cycling News, Steephill.TV & VeloImages, The Denver Post, 9News Denver (KUSA), Pedal Dancer® and Pro Velo Passion. Photographer and journalists tweets from the race (I will add more as I verify they are at the race, and tweeting): @karenrake (Pedal Dancer), @Eibhir (Oran Kelly), @butterflywriter (Mary Topping of Pro Velo Passion), Darrell Parks (@DarrellParks), Brian Hodes (@veloimages). I highly recommend going to Steamboat Springs the weekend before the race starts to be part of the pre race excitement. See the team presentation (usually on Saturday) and ride on the roads with the pros as they train on Saturday and Sunday (August 15th and 16th). 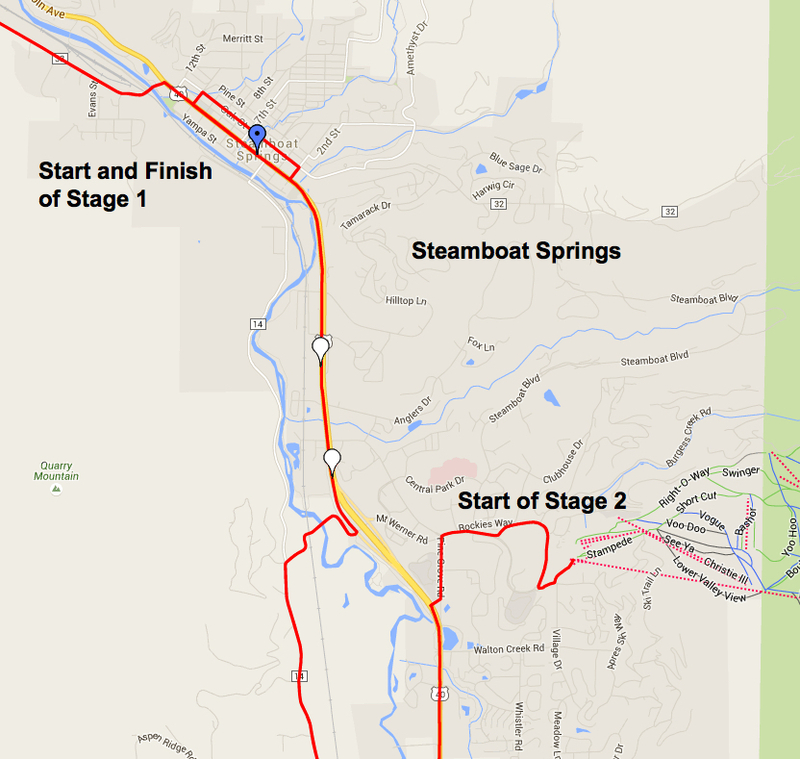 If you stay for a long weekend, you will get to see the entirety of Stage 1 and the start of Stage 2 in Steamboat Springs on Monday, August 17th and Tuesday, August 18th. I recommend bringing a bike with you to Steamboat springs. Well developed bike paths make it easy to move in and out of the city or to and from outlying hotels, or to the start of Stage 2 with is not in downtown, but begins at the ski resort. Tip#1: show up at least 1.5 hours before the stage start (10:45 am) to see the riders near their teams buses. Some riders might be cycling to the start of today's stage, rather then driving, but all riders must sign-in at the stage. This is a good time to hear Dave and Brad briefly interview some of the riders. Tip #2: bring something to autograph (and two sharpies! ), just in case you catch a rider at a team bus or on his way to or from the sing-in stage. Tip #3: Use your Tour Tracker app, or bring a print out of he startlist, so you can identify a rider by his dossard (bib number). Read more about dossards: Word of the Day: Dossard by Pedal Dancer®. Tip #4: If you like VIP treatment, buy a VIP ticket to the finish of Stage 1 the day before, rather than the start of Stage 2 (sorry race organizers, I need to tell it like it is). 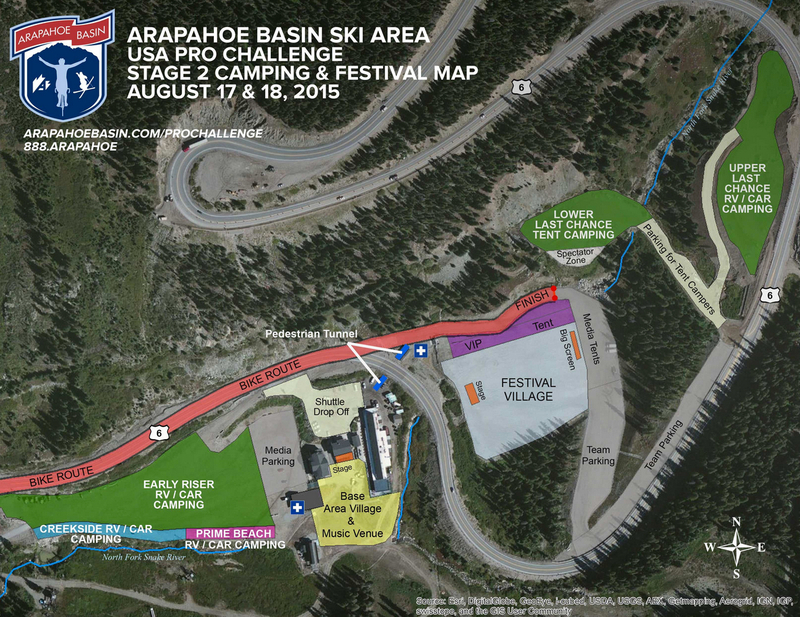 Tip #5: If you plan to chase the race to Arapahoe Basin, think about easy exit before you park your car at the start. Within 15-minutes, all team and race vehicles will have moved out. It is a 2 hr 25 min drive from Steamboat Springs to A-Basin via Hwy 131 and I-70 through Avon and Vail. If you do not stop at all, you should arrive by1:30-2:00pm at Keystone. The last shuttles leave Keystone's River Run parking lots by 2:15 or so (approximate). The road closes to ALL vehicles at 2:30pm. Return shuttle runs again from A-Basin to Keystone from 6:00-10:00 pm. the distance between Keystone and A-Basin is 6.6 miles. Tip #6: I would bring my bike! Upon arriving in Keystone, I would park and ride the 6.6 miles up the hill (you won't need lycra for this ride). After the stage I am free to coast down to my car anytime I like. Tip #1: Go down the road 200m - 500m (west) from the finish line, there will be a small bunch finish to the line and you will get a feel for who will win the stage just meters away, with an easier view. Tip #2: Then you will have an easy walk to the stage, to get a good spot to see the podium presentation, which happens 15-20 minutes after the finish. Tip #3: If you are not able to get a good view of the finish - the riders will pile up after the finish line (grey area above, marked 'media tents') where their soigneurs will greet them with drinks and towels, etc. This can be good people watching and your best chance to see the riders up close (and see the effort on their faces after the climb). 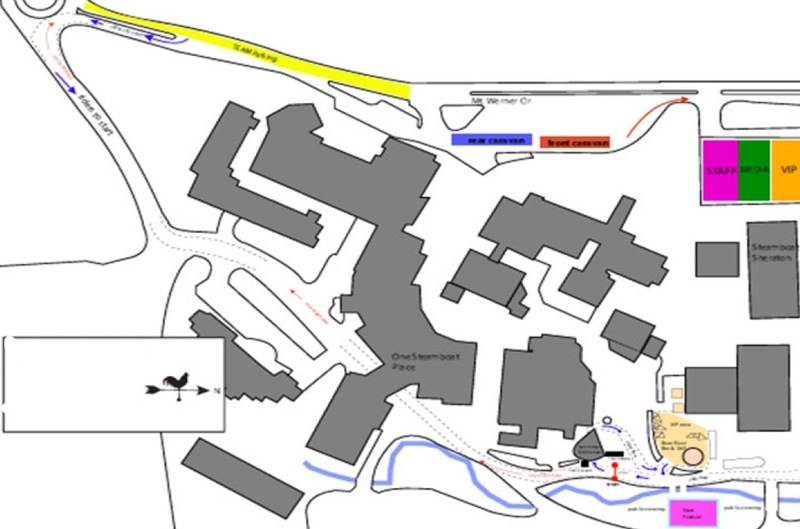 Once this care phase is over the riders will go up the road to their buses marked by 'team parking' on the map above. Generally once they step onto their bus you will not see them again. Showers, meals and massage are a priority for recovery. Tip #4: Bring an RV or car camp. There is fantastic (!) bike riding (and hiking) in this area, it is a perfect opportunity to behave like those mad fans of the Tour de France who camp out overnight awaiting the stage; only A-Basin has all kinds of fun activities to welcome spectators including a 5:30 p.m. - 9:00 p.m. - FREE CONCERT! (Base Area Village), the night before, August 17th. 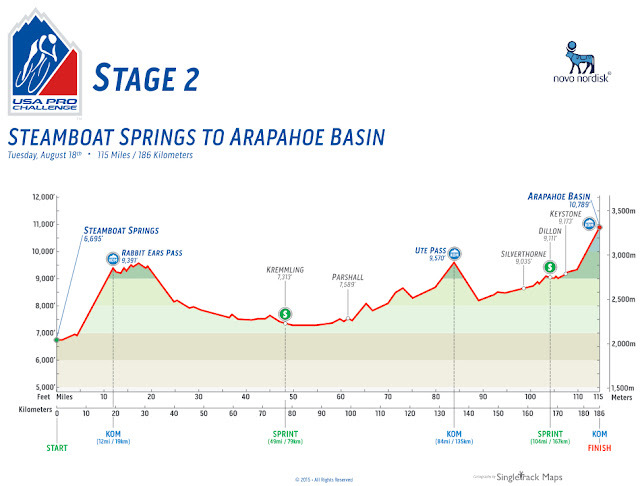 Tip #5: If you are deciding between a VIP ticket at A-Basin or Breckenridge, and like bike racing, I would definitely buy Stage 2 Finish VIP. Look at that long tent set up at the finish; in Breckenridge the VIP tent sits adjacent to the finish and is mostly a meet-n-greet space. Tip #7: Ride up Loveland Pass before the stage. I would bring a backpack (I use musette bags) with a tshirt shorts/skirt, flip flops and a hat, to change into after my ride. (If you have a VIP pass, they might even hold your bag for you while you ride up the pass, or you can ditch it behind a tree). You'll have your rain jacket (of course!) and food and drink will be available for purchase at the ski area. For more information on the ride up Loveland Pass, please see the Pedal Dancer® Guide Page: COLORADO CLIMBS. Tip #8: Stay to enjoy free concerts between 5:30-10:00 pm at Arapahoe Basin. Should I buy a VIP ticket to the USA Pro Challenge? 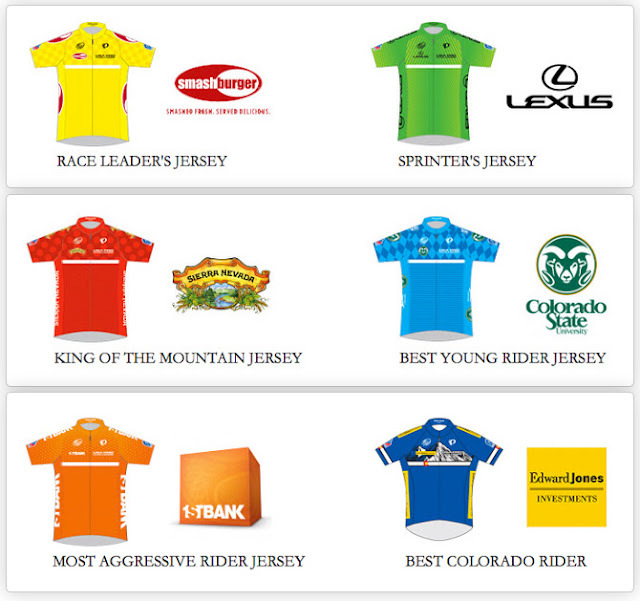 Which Teams will race in the USA Pro Challenge 2015? 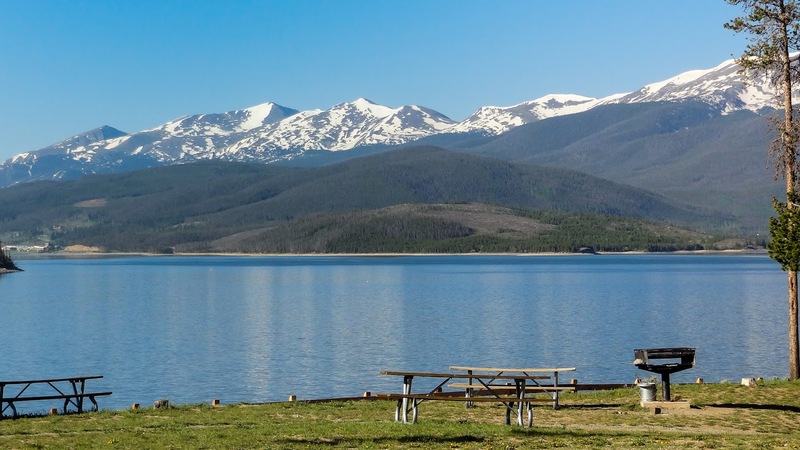 So you want to tour Colorado on a bicycle? 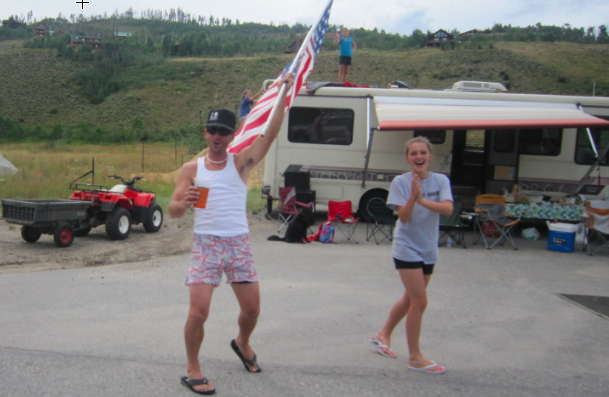 How to see Stage 5 of USA Pro Challenge 2015 - Breck ITT! If your are riding your bike to the finish of Stage 2 and want to know where food, drink, and facilities are located on route, you will appreciate my detailed route at Ride with GPS: Loveland Pass from Dillon through Keystone and back. Pedal Dancer® Guide Pages help you have a better vacation in Colorado. Follow me on Twitter as I run around inside and outside of the barriers and tweet from the race as @KarenRake see you there - Karen.